Just recently, I have been going 'back to basics' by analysing my basic swing technique and in particular, racket preparation. This is because I have become aware of some basic flaws in my technique, which I am absolutely certain is preventing further progress, as evidenced by the fact that I have 'plateaued', and even recently gone backwards, in my local league. Anyway, I have been taking a much closer look at how the pros do things by watching video clips in slow motion and by studying still images. This has led me to think about something that I had never properly considered before - what should be done about your 'non racket' arm. At present, I just sub-consciously hold it vertically downwards to keep it away from the main swinging action of my racket arm. I recently attended the final of English Grand Prix at Birmingham University (Willstrop v Lincou) and took some video and still shots, and noticed through this in particular that both players, and particularly James, do something quite different, which looks a deliberate part of their racket preparation and swing. They tend, particularly on the backhand and as the racket reaches its highest point on the backswing, to raise the non racket arm upwards with the elbow bent and the fingers fanned outwards. See the link to the still image I took for a good example from James. As the player moves to strike the ball, however, the non racket arm does drop down to point towards the floor and straighten out, although the fingers remain fanned out. I think a number of pro players also adopt a similar technique. Can anyone enlighten me as to what the function of this movement of non racket arm is, whether it is integral to good swing technique and is therefore something to try to build into your own swing? My theory is that it is part of ensuring good balance throughout the swing. Any views would be most welcome. It is probably yet another thing to think about in my quest for a better swing - at the moment, RACKET UP (!!) seems to be dominating my thoughts!! The non racket arm 'scissor action' is a very natural thing to do when performing a backhand. It maintains perfect body balance through the shot. On a pure physics level, With both arms by your sides the body is balanced, therefore if one arm extends ( i.e shot follow-through) then the other arm has to straighten out also to restore the balance. In practice of course, it is entirely possible for you to stand with one arm out because your core stability muscles make sure you don't fall over! If you look at different players you will notice they do this 'scissor action' to different degrees. Maybe their different body types need more or less of it to maintain their feeling of balance when playing a shot. If it doesn't come naturally to you, then I would summize that your particular body mechanics generate enough balance for it to not be an issue for you. All that is happening is that you muslces are helping to keep you balanced instead of you providing equilibrium through technique. If you want to see a player with a very prominent scissor action on the backhand side watch Graham Ryding, As I said though if it doesn't come naturally to you, then I wouldn't worry about it. Indeed, just concentrate on 'RACKET UP'! I tried this technique for a short while today during a solo practice session to see what difference it made and it's hard to discern exactly what benefit it gives. I think it may merely be a kind of 'ritualistic' movement adopted by certain pros as part of their shot preparation. I found it made me think a bit more about my racket positioning, footwork and shoulders, plus I felt a bit better balanced, although this would naturally come from the aforementioned elements per se. As you say, SamBWFC, if the pros are doing it, there must be something in it, but I disagree about it looking silly as someone like James Willstop can never look 'silly' on a squash court - although thinking about it, someone not so good impersonating his technique probably can!! Rita, thanks for your additional analysis. I am ever the realist when it comes to trying to emulate the pros and don't ever pretend I can be a James Willstrop (the thing we are most likely to ever have in common is our first name! ), but I think there is a lot to learn by analysing their basic techniques. For now, I am following your good advice by being more concerned about my basic racket preparation, as I note that I am still tending to drop the wrist from the cocked position during the back swing, making the racket point more towards the floor, and then snapping the wrist back up at the top of the backswing and during the downswing, which is effecting shot control and accuracy. Breaking the bad habits of a lifetime is going to prove a real challenge but I never thought it would be any different! 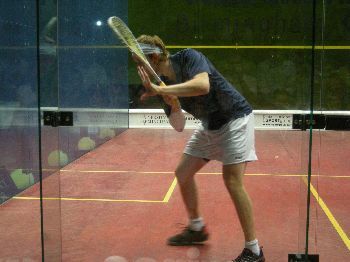 I tend to do what Willstrop is doing in the picture, especially when I hit a backhand shot. I don't know why I do it, I don't know what benefit it does give me and I think it looks pretty silly to be honest, but if the pros are doing it also then I'm not complaining! jim - now I have uploaded the pic I can see what you are talking about. The pic was sitting there ready to be added, no problem. The amount of pressure the player is under, eg stretched, stable, etc. The height of the ball being struck, and in this pic I cannot see the ball but it would be at least as high as his knee (my guess) which would be about the height of the "tin" - if the ball is lower than the tin, the open racket and elevation becomes a more important consideration in the backswing. The speed of the ball being hit, whether it has got power in it (and if it is bouncing high it would have for sure). The lower bounce would need more leverage in the swing if the return was to be aggressive, and an open racket to prevent an error. The non racket arm will almost surely straighten as the ball is struck and the shoulders open up. The stance is relatively closed (no pressure, well in position to hit the ball), looks like the ball has overbounced off the back wall and he is just following it down preparing to hit it. Therefore, less effort required to get power. jim - don't try to be a James Willstrop, unless you have all the perceptive motor skills (points mentioned above) in place. James knew when he saw the ball fly past him about where it was going to land, what position he would strike it, and the type of return he would be capable of doing, and then at the last minute had enough options to change his mind, eg drive, lob, drop or boast. That preparation tells me he is not going to lob or drop as he is very close to hitting the ball (standing over it in fact). James Willstrop would put in about 6000 hours of practice a year and would have been on the court for fifteen years, so it is unfair to expect to follow their act without being about to read the amount of cues well in advance as the pros can. Don't be discouraged just stick to the basic swing which we are putting in front of you and gradually you too will become automatic, and the amount of cues you recognise during a game will increase, your variety of strokes will also increase. Rita - re loading a link, I am trying to do this via the Add or Manage Pictures feature. I firstly loaded up the image (entitled James Willstrop backhand racket preparation) to the community images. This seemed to work, but when I click on the Add or Manage Pictures link itself, my system looses all internet connectivity and I have to reboot. This was last night, but I have tried again this morning and the same thing happens. I have successfully added a link to an image using this method previously, so can't think why this would happen now. I'll post a Squash Geek message to this effect for Ray. Thanks for your tips - I'll take it all on board and comment at a later stage, but I had guessed it would be important and a lot to do with balance. Re my work status, I think you are probably going by my email address. The building I do is in fact in the marketing sense, i.e. building business, so I am not as physical in my work as you may imagine! If I tried to carry a piece of 6 x 4 on a roof, I would more than likely fall off! jim - about the non racket arm. I will digress from squash as it is also a trade and the same principles apply with respect to angle, height, etc. Bio-mechanics apply to squash, just as they do to you who I think might be a builder. The importance of the non-racket (or holding hand/arm) can be demonstrated when carrying a bucket of water, the wings on a plane, or a bird flying, and a builder climbing on a roof carrying a piece of 6 x 4 standing on a beam, etc.. So you get how important the non-carrying/wing/arm is as it applies to the non-racket arm when playing squash. Look at a cricketer throwing a ball back to base, and depending on how far it has to be thrown depends, to some extent, will influence how open the shoulders are in the initial phase of the throw. Try doing these things with the non-dominant hand hanging down and see how the movement is impaired and the momentum lost. Yes, you said balance, and the moving and fanning of the arm is happening as the direction is adjusted and balance readjusted. Most of our published photos and videos are done with specific key elements in mind and generally under a controlled environment, so our points are easily identified. See the photos under Strokes and Movement. In the video Forehand Drive Moving Forward you can see the non-racket arm used to balance the swing and recovery/movement, and when striking/impact the shoulders open out and the chest opens up (better for breathing, though our players do not grunt)!. Looking at the various uses of the non-racket arm is interesting in these top matches and it appears the more off balance the player is the more the non-racket is used in these top games. Looking at the non-racket arm in some of these top player's videos it shows the arm more extended as better balance and recovery is required. I suggest keeping the arm out of the way and chest open, and be sure if you hang the arm down, especially on the backhand, not to crack yourself on the elbow or knuckles. jim - thanks for mentioning about the link problem - so when you put in a link you copy the link, hit the little world icon on the top of the posting box, a box appears, paste the link in the space provided, click OK and it then highlights the link? If that does not work Ray needs to know, so please carry out a further post under Squash Geek. I Can't find the link anyway, but I've noticed this with a few players at my club, and I think it sort of just helps them keep up with the basics, E.g, where are those fanned fingers pointing towards, in a general direction? If they are pointing toward the side wall, it is to help them remain side-on to the wall, as by brining your arm that way, it sort of helps you(or is that forces you to?) to turn towards the side wall.